Product categories of Fiber Optic System, we are specialized manufacturers from China, Fiber Optic System, Fiber Optic Cable suppliers/factory, wholesale high-quality products of Fiber Optic Internet R & D and manufacturing, we have the perfect after-sales service and technical support. Look forward to your cooperation! Fiber optic systems include fiber optic terminal box, fiber optical Patch Panel, connectors, PLC Splitter, Pigtail Patch cords, cable assemblies, accessories for both single mode and multimode applications. Together, these components provide complete solutions for today`s high data rate Fibre Channel and Ethernet applications, and support future readiness for 40 Gb/s and 100 Gb/s data rates, maximizing physical infrastructure performance, modularity, and scalability. 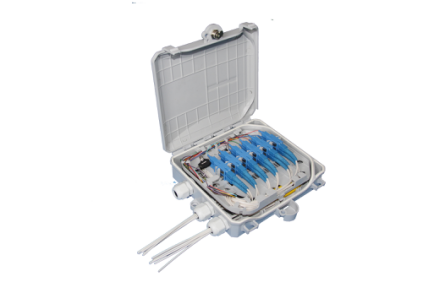 The Fiber Optic Terminal Box is designed for optical ber cable termination. It allows FO cable termination by splicing pigtails, and passive optical splitters 1:8 and installation. The ruggedized box is designed for both indoor and outdoor applications. The MOPF includes a holder for SC type coupling adapters and a splice cassette for heat shrinkable or mechanical splice protection sleeves and two separate holders for passive splitters. A weatherproof lock is provided. Provision for up to 2 optical ber cables to enter and 8 smaller entries to leave the enclosure through weatherproof cable glands is provided. The outlet ports allow installation of 8 connectorized patchords. Additionally, one universal cable output port is included.